The beauty of language transcends boundaries and cultures. Learning a language other than our mother tongue is a huge advantage. But the path to bilingualism, or multilingualism, can often be a long, never-ending one. There are so many little nuances that we get lost in the sea of words. 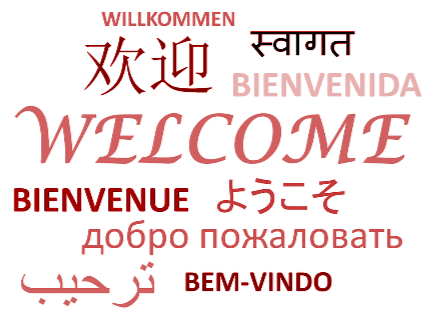 Things have, however, become so much easier with online translation services (I’m looking at you Google Translate!). I have always wanted to learn a language other than English. I tried my hand at learning German (or Deutsch), back in 2014. It was both fun and challenging. I had to eventually quit but I harboured a desire to start again. Fast-forward to 2019, I am fortunate to be able to build a language translator for any possible pair of languages. What a boon Natural Language Processing has been! In this article, we will walk through the steps of building a German-to-English language translation model using Keras. We’ll also take a quick look at the history of machine translation systems with the benefit of hindsight. 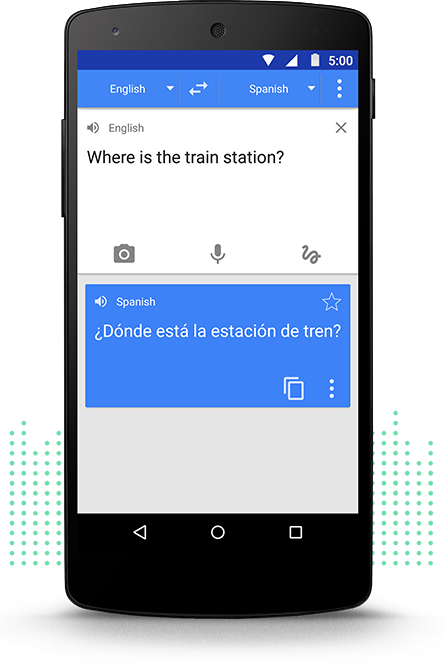 Most of us were introduced to machine translation when Google came up with the service. But the concept has been around since the middle of last century. Research work in Machine Translation (MT) started as early as 1950’s, primarily in the United States. These early systems relied on huge bilingual dictionaries, hand-coded rules, and universal principles underlying natural language. 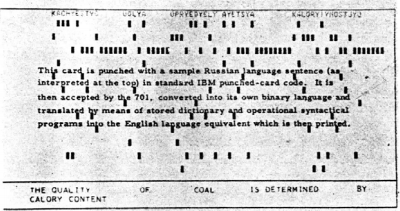 In 1954, IBM held a first ever public demonstration of a machine translation. The system had a pretty small vocabulary of only 250 words and it could translate only 49 hand-picked Russian sentences to English. The number seems minuscule now but the system is widely regarded as an important milestone in the progress of machine translation. Not exactly a glowing recommendation! A long dry period followed this miserable report. Finally, in 1981, a new system called the METEO System was deployed in Canada for translation of weather forecasts issued in French into English. It was quite a successful project which stayed in operation until 2001. 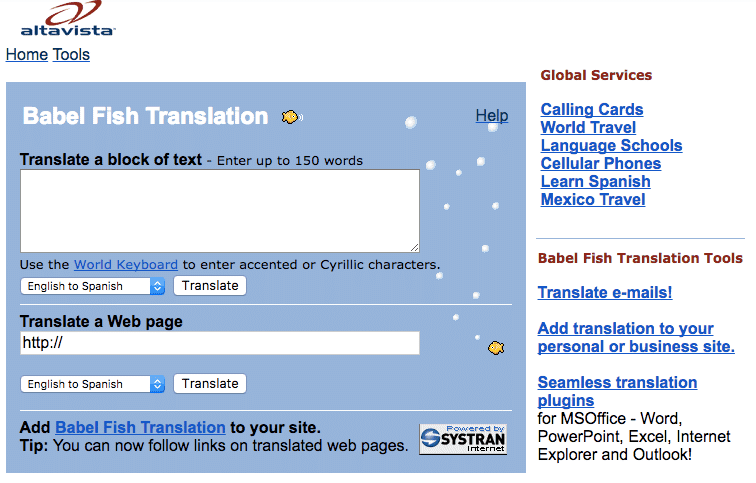 The world’s first web translation tool, Babel Fish, was launched by the AltaVista search engine in 1997. And then came the breakthrough we are all familiar with now – Google Translate. It has since changed the way we work (and even learn) with different languages. Let’s circle back to where we left off in the introduction section, i.e., learning German. However, this time around I am going to make my machine do this task. The objective is to convert a German sentence to its English counterpart using a Neural Machine Translation (NMT) system. We will use German-English sentence pairs data from http://www.manythings.org/anki/. You can download it from here. 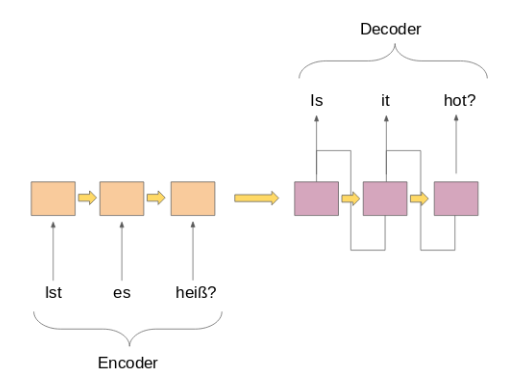 Sequence-to-Sequence (seq2seq) models are used for a variety of NLP tasks, such as text summarization, speech recognition, DNA sequence modeling, among others. Our aim is to translate given sentences from one language to another. Here, both the input and output are sentences. In other words, these sentences are a sequence of words going in and out of a model. This is the basic idea of Sequence-to-Sequence modeling. The figure below tries to explain this method. It’s time to get our hands dirty! There is no better feeling than learning a topic by seeing the results first-hand. We’ll fire up our favorite Python environment (Jupyter Notebook for me) and get straight down to business. Our data is a text file (.txt) of English-German sentence pairs. First, we will read the file using the function defined below. Let’s define another function to split the text into English-German pairs separated by ‘\n’. We’ll then split these pairs into English sentences and German sentences respectively. We can now use these functions to read the text into an array in our desired format. The actual data contains over 150,000 sentence-pairs. However, we will use only the first 50,000 sentence pairs to reduce the training time of the model. You can change this number as per your system’s computation power (or if you’re feeling lucky!). Let’s first take a look at our data. This will help us decide which pre-processing steps to adopt. We will get rid of the punctuation marks and then convert all the text to lower case. A Seq2Seq model requires that we convert both the input and the output sentences into integer sequences of fixed length. But before we do that, let’s visualise the length of the sentences. We will capture the lengths of all the sentences in two separate lists for English and German, respectively. Quite intuitive – the maximum length of the German sentences is 11 and that of the English phrases is 8. Next, vectorize our text data by using Keras’s Tokenizer() class. It will turn our sentences into sequences of integers. We can then pad those sequences with zeros to make all the sequences of the same length. We will now split the data into train and test set for model training and evaluation, respectively. It’s time to encode the sentences. We will encode German sentences as the input sequences and English sentences as the target sequences. This has to be done for both the train and test datasets. We are using the RMSprop optimizer in this model as it’s usually a good choice when working with recurrent neural networks. Please note that we have used ‘sparse_categorical_crossentropy‘ as the loss function. This is because the function allows us to use the target sequence as is, instead of the one-hot encoded format. One-hot encoding the target sequences using such a huge vocabulary might consume our system’s entire memory. We are all set to start training our model! We will train it for 30 epochs and with a batch size of 512 with a validation split of 20%. 80% of the data will be used for training the model and the rest for evaluating it. You may change and play around with these hyperparameters. We will also use the ModelCheckpoint() function to save the model with the lowest validation loss. I personally prefer this method over early stopping. 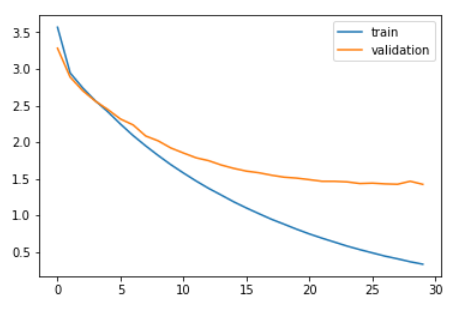 Let’s compare the training loss and the validation loss. As you can see in the above plot, the validation loss stopped decreasing after 20 epochs. Finally, we can load the saved model and make predictions on the unseen data – testX. Our Seq2Seq model does a decent job. But there are several instances where it misses out on understanding the key words. 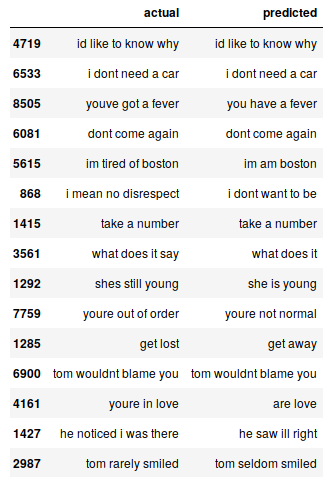 For example, it translates “im tired of boston” to “im am boston”. These are the challenges you will face on a regular basis in NLP. But these aren’t immovable obstacles. We can mitigate such challenges by using more training data and building a better (or more complex) model. You can access the full code from this Github repo. Even with a very simple Seq2Seq model, the results are pretty encouraging. We can improve on this performance easily by using a more sophisticated encoder-decoder model on a larger dataset. Another experiment I can think of is trying out the seq2seq approach on a dataset containing longer sentences. The more you experiment, the more you’ll learn about this vast and complex space. If you have any feedback on this article or have any doubts/questions, kindly share them in the comments section below. It’s a wonderful article.One request,can you show us the implementation in R? Thanks Sayam. I will try to implement it in R as well and share it with you all. I am looking for models in life insurance analytics. Since you have experience in BFSI, did you develop any such model like lapsation, claims etc ! For some reason,the array function is not working properly.The function should return just an array while it is returning a list of array and shape is also not correct. Can you help me debugging it. By the way…Very good article. Which part of the code you are referring to? I am referring to code in the 4th code block. Here the function is returning an array of lists instead of an array of arrays.I believe this is due to the fact that in the last list the english translation is missing.I was able to fix this by removing the last list. Also I would recommend adding file.read().decode(‘UTF-8’).decode(‘ascii’,errors=’ignore’) when you are reading the file as it is giving encoding characters without this. Thanks Dinesh for pointing it out. The correct code is %matplotlib inline. I have changed it in the blog as well. 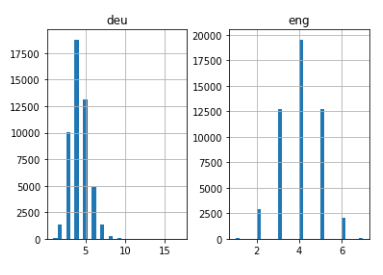 Hi, I am following this tutorial as a bonus section for an assignment, but I am training on my own dataset which translated French to English. When I get to the training step, I get the error: Received a label value of 15781 which is outside the valid range of [0, 11767) (I have 11767 English words in the English vocabulary and 15789 words in the French vocabulary) so I assume the error is trying to use a value outside of the possible English integer encoding, which makes sense because French words can go > 11767 while English words can’t. However, when I tried running it with your dataset, and you also have a difference in the number of words in your English and German vocabulary, you don’t have this error. Can you explain to me why and any possible way I can fix this? I am really looking forward to your response! Hi, please recheck the size of the vocabularies of your inputs and targets, repectively. Great article, nice help in learning about seq2seq. Can you add a few lines that would allow me to send a message in english to be translated. Would be a nice addition. Hi, I used this for a different dataset (not language translation). Model runs fine but im getting all same(blank) predictions . Any idea what could be the issue? I guess the training data is not sufficient. It happened with me also when I was working with a smaller dataset. Nice article, I’m trying to use this code in a large sentences dataset so I want to retrain the model multiple times, can you please provide us with the implementation of that.